Generally, companies with better business models have superior margin versus their competition. This table shows the profit per vehicle for several automakers in 2010. Which business model do you think is superior? From this data, it seems that BMW and Daimler (Mercedes-Benz) have the best business models. These models generate exceptional overall profits as well as industry-leading profit per vehicle. While the design of business models tends to focus on the gross margin generated, you must balance the total margin generated with your overhead expenses. It’s possible to have outstanding margins and still have a poor business model. For example, suppose you create a $100 piece of software that you sell on the Internet that costs nearly nothing to manufacture/distribute. So far, your business model is great; you have a 100-percent margin. What if you work full-time for your fledgling software company and sell only ten copies per year? You’re working for $0.50 per hour. Ouch! Your business model needs excellent margin percentage plus enough total dollars of margin to be successful. Solazyme has an interesting business model. The company makes synthetic oil from algae. Its proprietary process can produce products ranging from diesel fuel to $1,000/gallon cosmetic oil. The company’s average gross margin is 92.2 percent. Sounds pretty good so far, right? However, because the company is in perpetual R&D mode, the cost of all those smart scientists is outpacing the margin generated. For now, Solazyme has a business model issue. 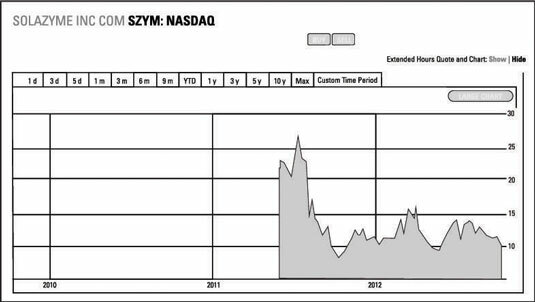 As you can see from the stock market chart in the figure, the market agrees. The market was excited about the business model when the company went public, but has cooled off as the company has failed to turn a profit.